When Janelle's grandfather dies in her arms, she sees in his eyes an answer to the undying question we all struggle with in life: Where do we go from here? By fate or by faith, she follows the mystery-of-the-eyes to find Chaplain Barber, the man who would save her from death's sorrow and change her life forever. Chaplain George Russell Barber is the last living chaplain from the D-Day landing on… Omaha Beach, June 6, 1944. He survived Normandy's bloodiest beach battle,"e;I dug like it was only up to me. I prayed like it was only up to God. Together, we dug that hole pretty deep. "e;He went on to march across Europe for eleven more months without a weapon. Armed only with his Bible and his faith, Chaplain Barber preached the gospel during the most dangerous war scenes of the European theatre in World War II, "e;There are no atheists in foxholes. 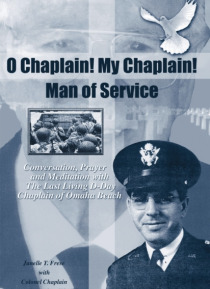 "e;One of the last of the red-blooded American boys, Chaplain Barber tells Janelle his life history like a Little Big Man of the Greatest Generation. From the cotton fields back home to the Horse Cavalry days, through three wars, the Space Age and the war on terrorism, his life of service grips the heart of the small town patriot and likewise spins the mind of the spiritually inquisitive. "e;The Bible has been known to stop a bullet, but that's not the only reason I believe. "e;Through their conversations, prayers and meditations, Janelle and the Chaplain mix the secret ingredients for the recipe of the Red, White and Blue in you.